Mamata Banerjee-led party TMC (Trinamool Congress) is constantly attacking Prime Minister Modi and BJP in the Parliament on the Citizenship Amendment Bill, 2016. On Tuesday, the party MPs who came to protest in Parliament premises adopted a different approach. TMC MPs came in hand with a board and poster for protesting in black clothes. Some MPs had taken a mask of Prime Minister Narendra Modi and took something like a stick in his hand. 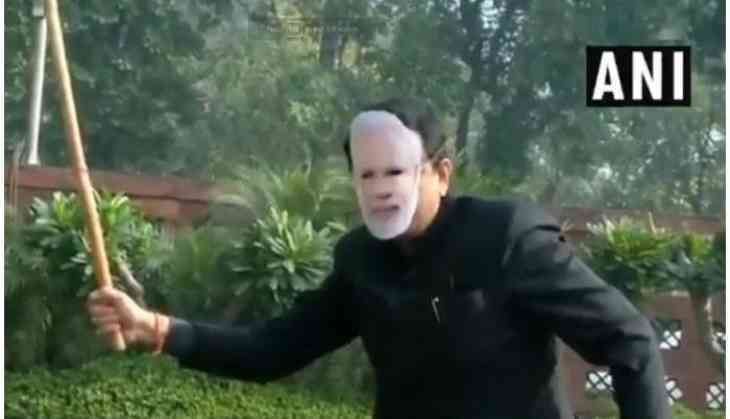 MP wearing Modi's masks can be seen beating the members with a stick. TMC MPs are opposing a change in the Citizenship Amendment Bill. It is proposed that the period for living for citizenship in this bill is reduced from 11 years to 6 years. The Indian citizenship to Hindus, Sikhs, Buddhists, Jains, Parsis and Christians of Afghanistan, Bangladesh and Pakistan are proposed to be given without valid document. TMC MPs are opposing the bill in Assam by describing it as a crisis on the rights and identity of local and native citizens. Four Opposition parties and two supporting parties of BJP are opposing a change in the citizenship bill (citizenship bill). In the opposition parties, the Congress, TMC, CPI (M), SP also have two BJP allies including the Assam Gana Parishad and Shivsena. Opposition parties have a major argument in opposing this bill that religious recognition has been given prominence in it. It is also argued by the Opposition that to build a religious identity for citizenship revision is against the original spirit of Article 14 of the Constitution. Article 14 explains the rights of equality. 80% of docs treat only 28% patients. Swasth Bharat, anybody?